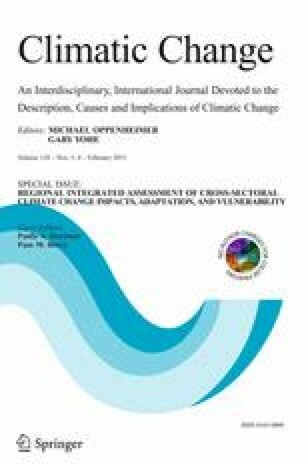 This article is part of a Special Issue on “Regional Integrated Assessment of Cross-sectoral Climate Change Impacts, Adaptation, and Vulnerability” with Guest Editors Paula A. Harrison and Pam M. Berry. The online version of this article (doi: 10.1007/s10584-014-1313-y) contains supplementary material, which is available to authorized users. The research leading to these results has received funding from the European Commission Seventh Framework Programme under Grant Agreement No. 244031 (The CLIMSAVE Project; Climate change integrated assessment methodology for cross-sectoral adaptation and vulnerability in Europe; www.climsave.eu). CLIMSAVE is an endorsed project of the Global Land Project of the IGBP. MT was in addition supported through project: ‘Building Up a Multidisciplinary Scientific Team Focussed on Drought’, no. CZ.1.07/2.3.00/20.0248.